It’s no secret by now that I’m a big advocate for positive affirmations. I mean just look, it’s how I begin every single blog of mine. I intended it to be that way – I want the first thing you see when you glance over at my blog to be an affirmation that I pray will manifest in your day and life! It’s just second nature to me at this point to wake up and declare things like “today is gunna be amazing,” “I am so happy and grateful now that I have X,Y,Z” (X,Y, & Z being dream circumstances I envision for my life.) Even if I don’t presently have those things, I speak them into existence– as if they already do exist. And I learned all of this from two places: The Bible of course and second, a book called The Secret. A lot of people are afraid of the Bible because it seems so long, intimidating, dated, heavy, confusing bla bla bla. (I used to think all of these too by the way.) But in time I’ve learned how to read it effectively for MY life and feel so thankful that there are additional tools out there like The Secret (which comes in audiobooks, DVD and hard copy) that help people take control of their lives. The Secret DVD also introduced the concept of vision boards to me. Vision boards are so powerful and effective at keeping people “in check” with their thoughts. It’s when you cut out WORDS and images or print off words and images from the internet of your dream life; relationship, career, car, physique, family, EVERYTHING… and paste them onto a poster board. Very #DIY and fun! I’m so happy that such a huge wave of vision board parties and online vision boards a la Pinterest exist in such a big way these days! Mine is right next to my bed so it’s literally the first thing I see in the morning. The second thing I see in the morning is my mirror that I’ve written positive affirmations on as well- so when I go to wash my face and brush my teeth I am forced to read things like, “you are attracting amazing people, jobs, contracts, opportunities and favor into your life,” and “you are beautiful just the way you are,” and “your dreams have come true. Congrats” LOL. Seems silly but I have evidence that this stuff really works! It’s creepy and cool! So last night was “dress rehearsal” for the girls competing in the Miss Inner Beauty Pageant and it all came full circle to me when I saw the shirts that they will be wearing for their opening number. You guys… the cutest. 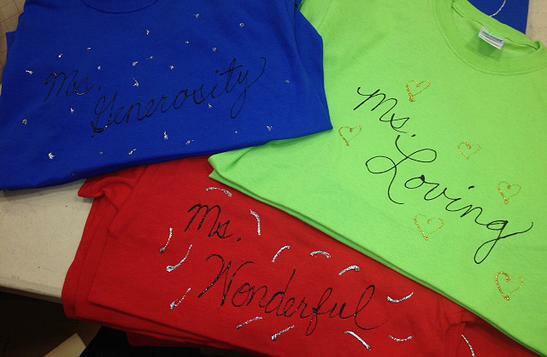 The shirts were adorned with their “inner beauty” titles that they each chose for themselves!!!! WORDS that describe who they are and who they want to be. We have “Miss Joyful” “Miss Generosity” “Miss Outgoing” “Miss Loving” etc… You get the picture! UM I JUST MELT. They are declaring these inner beauty traits for themselves! IT IS SO POWERFUL that these young girls are clothing themselves in affirmations – words they want to speak into existence for their lives! I couldn’t be more proud to be part of such a huge wave in the lives of each of these young ladies. I hope this brings a smile to your face and encourages you to take control of your thoughts TODAY, speak positively and expect the best for your life. One positive thought today, right now, can change your entire day. It may start off small but before you know it you’ll have a huge wave of feeling good all day long. TRY IT. But take note, the same thing can happen with negative thoughts too. One negative thought can impact the rest of your day… it too can start off small, but then it spirals downward and builds into this huge wave of a mess. I look forward to the day that YOUR positive thoughts become REAL in your life… ahhh I am honestly just so excited for you! When I first learned “The Secret” back in 2008, I didn’t want to keep it a secret at all. I wanted to run and tell everyone. It changed my life in such a big way and that’s what I want for you. And WHEN it happens for you, I pray you feel compelled to pay it forward and help those around you to recognize the power of their minds. So I urge you to stop thinking things like “I am ugly” or “today will probably be a bad day” or “my mom will never understand me” or “no one likes me…I will always be alone…” AHHH seriously STOP ITTTTTTTT. “Thoughts become things. Ask. Believe. Receive” – XO, The Secret. So go out and be fabulous today! BE HAPPY. Be giving. Be a boss. Own your very own empire. Declare it. Expect it. And it will come!